French President Emmanuel Macron is scheduled to address Congress on Wednesday. Bricmont is author of Humanitarian Imperialism: Using Human Rights to Sell War. He is also a retired mathematical and statistical physicist at the University of Louvain, and the co-author of Fashionable Nonsense: Postmodern Intellectuals’ Abuse of Science. He posts regularly on Facebook. He said today: “The alignment of Macron on Trump is very interesting in many respects. At the time of the election, Macron was seen as the anti-Trump; after all the only politician supporting Trump then in France was Marine Le Pen. He was internationalist, pro-européen, sophisticated, while Trump was seen as vulgar and a narrow nationalist. “Besides, both Macron and Trump seemed to want better relations with Russia. 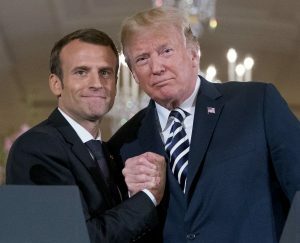 “Now, both Trump and Macron seem to have changed, for the worst. Trump seems to have given up his ‘America first’ policy and aligned itself completely with Israel, also on the necessity of destroying Syria. In doing so, he has worsened his relations with Russia. But Macron has followed a similar change. So, on the crucial issue of ‘regime change,’ they both seem to be allies but on positions to which they were both opposed in the past. “I say ‘seem’ because it is not clear what is really going on and the recent strikes against Syria were not very impressive from a military viewpoint. “It is interesting to see the evolution of Germany, where several voices opposed the recent bombing and seem to want better relations with Russia. Their parliament has said the strikes were illegal (of course all those wars are illegal, including those with German participation like the Kosovo war), which is also interesting. “The paradox is that this new Franco-American policy occurs when the justifications for it appear to be collapsing. The Skripal affair has never been clarified and looks more and more murky (if the poison was so lethal, how come the victims are still alive?). And the origin and nature of the ‘gas attack’ in Syria appear also increasingly doubtful and challenged by testimonies collected by Western journalists that are there.